So, you say you’re a fan of Disney theme parks and Star Wars, but you live on the wrong side of the country to attend Star Wars Weekends in Orlando? Not to worry! Even though there’s no *official* event planned for Disneyland in Anaheim, CA, the fans have taken matters into their own hands for the past three years. What began as a protest over the lack of a Star Wars Weekend event in the very park where Star Tours debuted has grown each year. Here’s the official press release of this unofficial event. Anaheim, CA, June 30, 2007 – The So Cal Star Wars Alliance will be holding the Third Annual Unofficial Star Wars Fan Day at Disneyland. All Star Wars fans, their friends, and families are invited. Last year was such a success with over 200 Star Wars fans in attendance. Over $200.00 was earned from T-shirt sales and donated to the American Cancer Society. We will be having a group photo taken at Sleeping Beauty’s Castle at 2:00 p.m. Commemorative T-shirts with a brand new logo are available. All profits from shirt sales will be donated to the American Cancer Society. For more information please visit www.starwarsdisneyland.com. Anyone who loves Star Wars and Disneyland is encouraged to attend. Looking forward to seeing you there! Be sure to check out the cool ‘hitchhiking Jedi ghosts’ artwork on their website. And if you’re in the Anaheim area, make plans to attend! 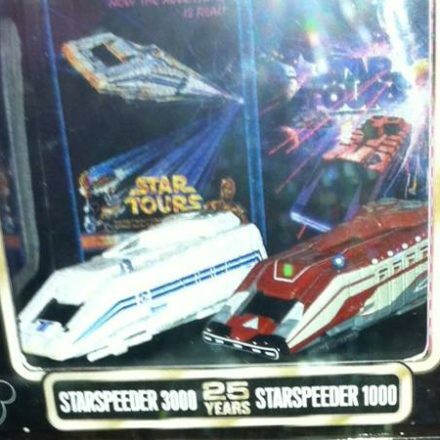 Star Tours 2 In 2008?